Simon wasn't sure of what I was asking him to do. 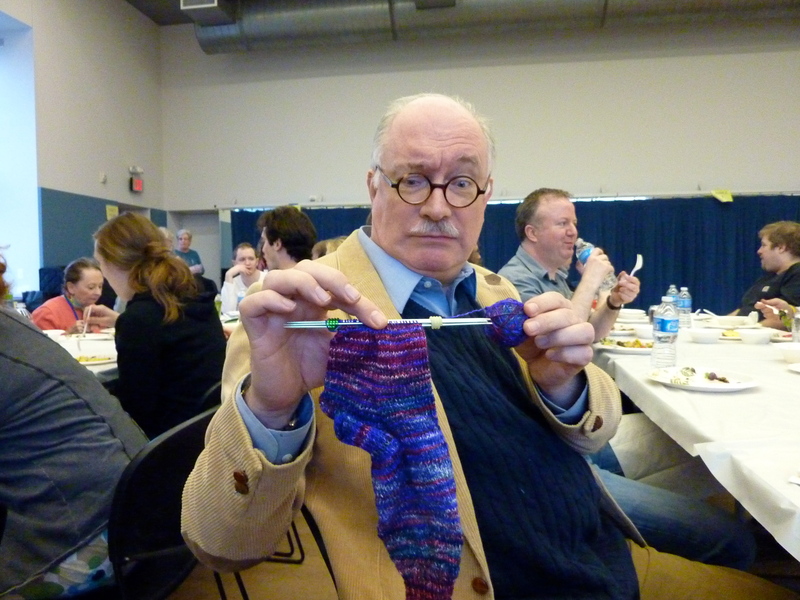 The always-delightful and very obliging Simon Jones, holding the sock last Wednesday. The good thing about working in a major regional theater is your access to the famous and semi-famous. 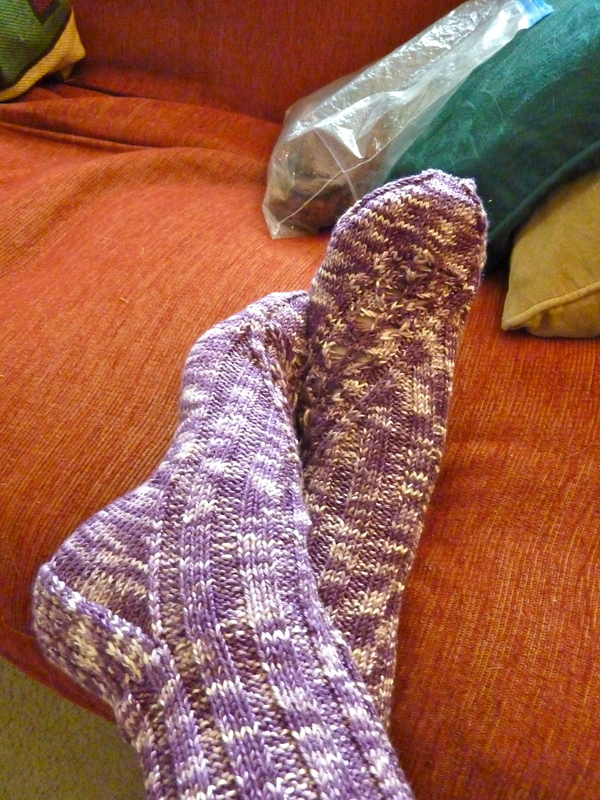 I finished these socks last night, which is good because Harriet Harris is also in this show – I’ll see if I can corner her next! Sorry for the absence – it’s been a crazy week at work so far, and I haven’t had a lot of down time for posting. One of my moving lights started shutting itself off during the performances on Wednesday, and so I spent extra time at work today re-aiming the replacement light to where it is supposed to go. That’s the difficulty with MLs – if it can be a lot of places, then when you have to fix it, you have to fix it everywhere. They’re awfully convenient though, so trust me, I get it. R and I try to stay out of the suburbs as much as possible, but R needed to renew his tabs on both the motorcycle and his car, so we decided to make a day of it. We went for breakfast at Fat Nat’s (a favorite we don’t get to much, since it’s all the way in GOLDEN VALLEY), and then headed to the Hennepin County government center. Now, there’s a DMV center right down the street from us – so why drive to the ‘burbs? Because at 1:00 in the afternoon in the ‘burbs, no one is at the DMV. Or so we thought. This is R looking annoyed after we had been waiting for about 25 minutes for his number to be called. 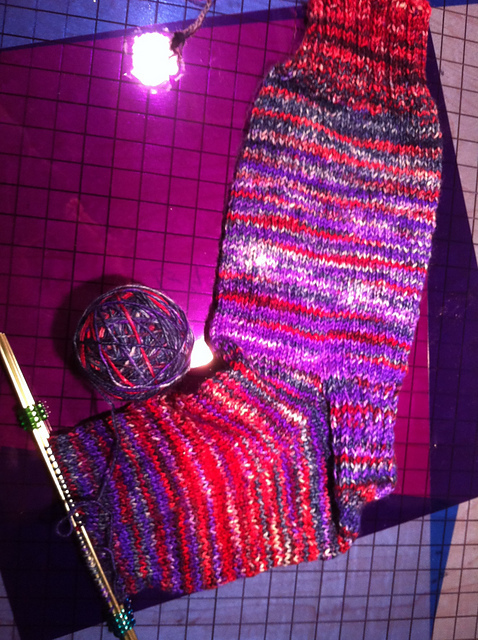 I didn’t mind; as you can see, I banged out the cuff and the beginning of the leg on sock #2. 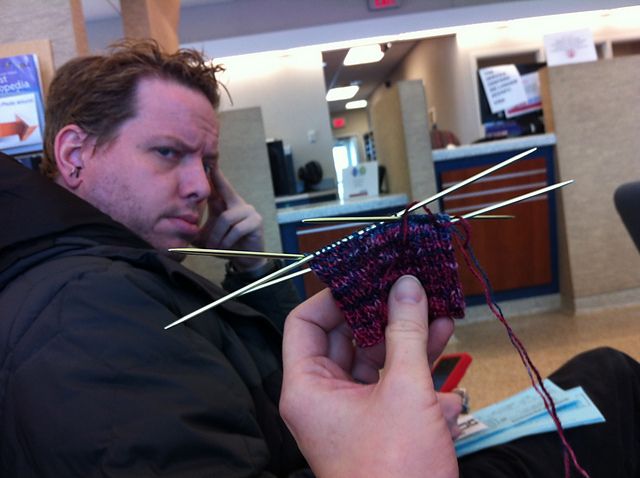 Maybe R should take up knitting. He’s so awesome. 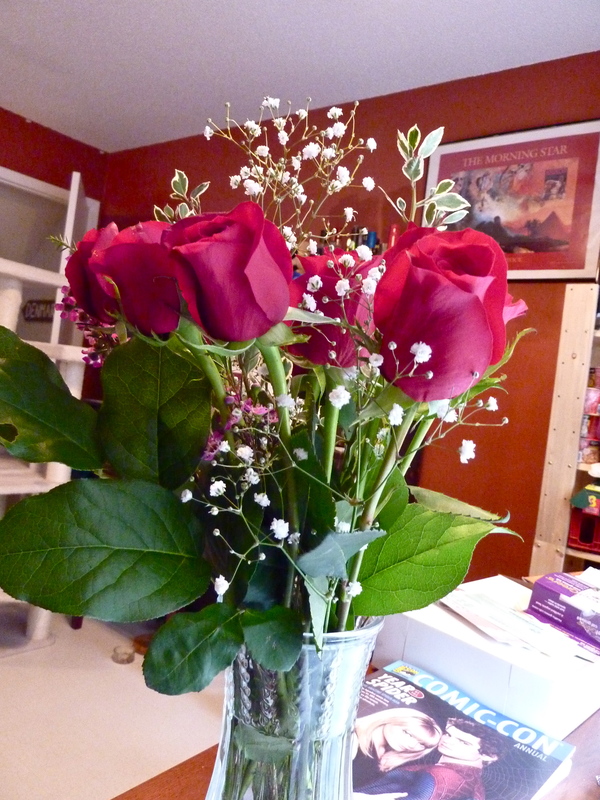 Plus, roses are WAY cheaper the day AFTER Valentine’s. Now that the January FOAMs are out of the way, I’ve been plugging away at a couple of small projects, just to tide me over until I dive into this sweater full-time. 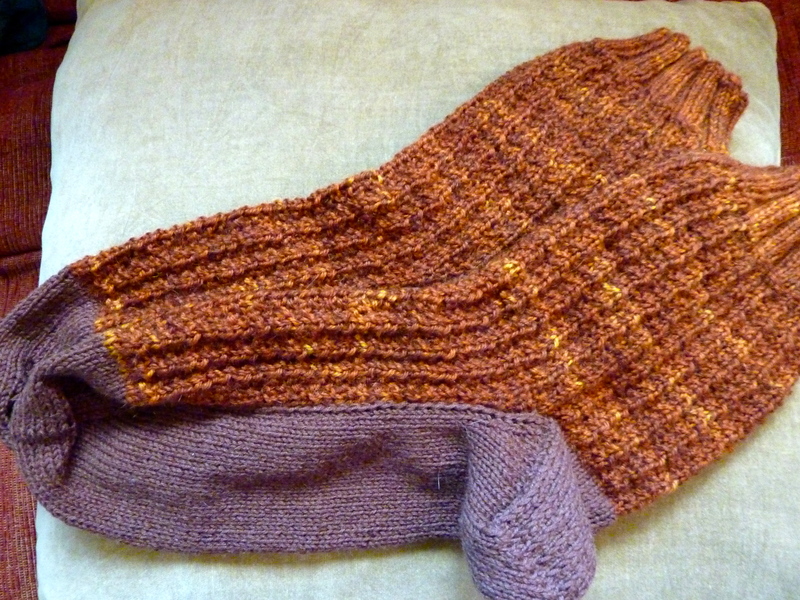 Today I’ll show you the first of what will hopefully be nearly identical socks. I hand painted this yarn in a sock blank at Shepherd’s Harvest last spring. I’ve been really compelled to keep knitting these, even though it’s a completely plain-jane sock — I can’t wait to see how the colors will play out! I’m almost done with the first, and if I can book it through the second these could be my February FOAM. What’s that, you say? It’s already half way through February? I know, I know. I want to make it clear that while I’m posting this on Feb. 13, these UFOs were, in fact, FOs before the end of last month. The delay lies in my inability to get finished things wrapped up and taken to the Post Office in a timely manner. As both of these objects were VERY belated Christmas gifts, they needed to arrive at their destination before I put them on the internet, just in case. Everyone in the family eventually gets socks, and D and A were the last holdouts. The trouble comes because my lovely SiL A, who is wonderful in every other way, is sadly allergic to wool. I have been hunting for years for a nice sock yarn that contains no wool at all. This summer, I laid my hands on a cotton/viscose blend from Aslan Trends. Concerned that the socks might not hold their shape, I worked some elastic thread into the first five rounds to give them a little more oomph. I guess we’ll see how they do. A’s socks are Kai-Mei by Cookie A., easily one of my favorite sock designers. I’ve knit several of her patterns over the years, and they always prove fun and interesting. This pair was simpler than many, but the lace inset that travels across the foot is ingenious. D’s socks are a combination of Pfeffer/Merrow’s Resoleable Socks and a stitch pattern I worked out, similar to a waffle stitch. These socks met a lot of fits and starts as I tried to figure out how to get the most of one skein of Mountain Colors Bearfoot that I’d been saving for a special project. It wasn’t going to be enough on its own, so I padded it out with a ball of Brown Sheep Cotton Fine in a contrasting color. Hopefully he’ll like them, and now they’ll be easy to mend if he wears them out! I’ve already got some things in the running for the February FOAMs, so more on those as they develop later in the week. 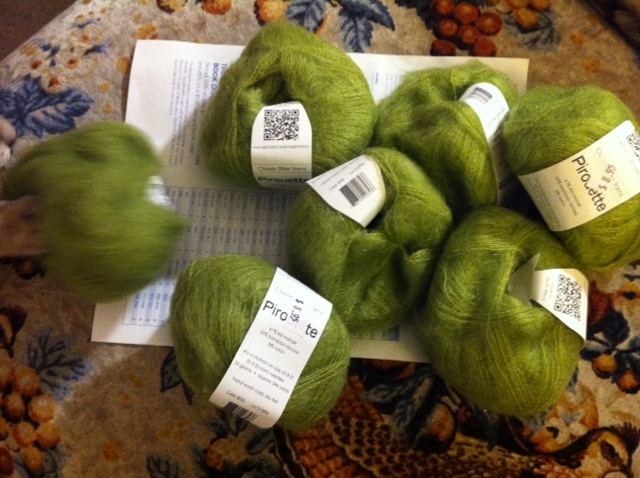 I also swatched for the green mohair sweater last night, and I’m starting to get excited for a new project. And now – to bed! Tomorrow I’m working a Mike Birbiglia show at the theater, and it’s going to be a long day. 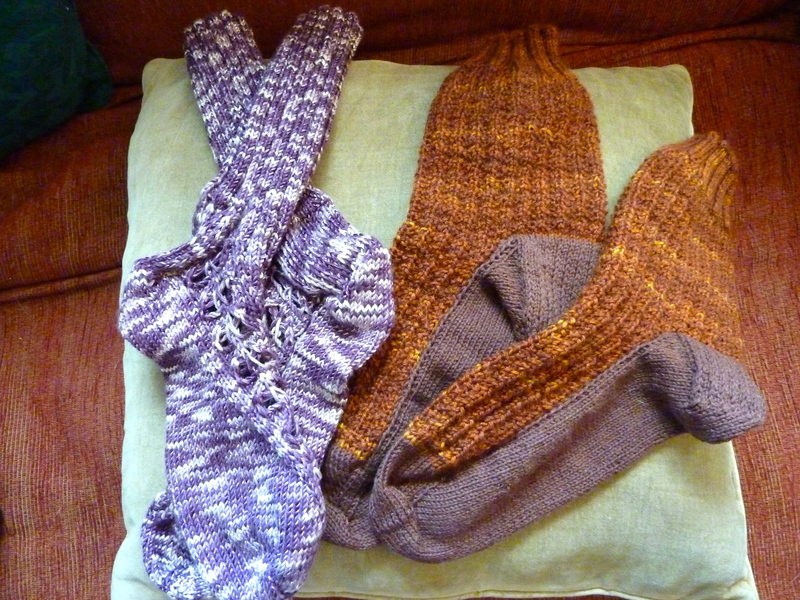 One of the delightful knitting blogs that I subscribe to is Alice Yu’s lovely Socktopus. I love reading the work of such talented sock designers (as I’m an addicted avid sock knitter myself). Today on the blog is the beginning of her FOAM-along; that is, Finished Object A Month. As I have quite a few WIPs languishing around in baskets gathering dust and cat hair, I think I’m going to play along, at least unofficially. Of course, January’s objects (yes, two of them) are secret knitting, since they should have been done in December in time to give to my brother and sister-in-law. SIL’s project is actually done except the end-weaving, but Bro’s has a long way to go yet. Once they’re done and in the mail I’ll post photos and descriptions of the machinations of these two objets d’art, but you’ll just have to guess in the meantime. My plan is to hold this together with a dark charcoal gray cashmere from a thrift store sweater I’m unraveling. I’m hoping that will tone down the GREEN a little. First thing first, though — FOAM!